We want to begin this blog by stating National Coatings never suggests or promotes patching or repairing sections of your roof without consulting us first - Call us! We truly are here to help you 800-423-9557. We suggest this specifically because some roofing materials contain ingredients that are incondusive to coatings and when sections of your roof contain these materials, it becomes a much more strenuous process to preserve and restore your existing roof. It can also potentially eliminate your option to save money and restore your existing roof by adding a Roof Maintenance or Restoration System. Thus forcing you into a roof tear-off, which is an expensive and timely project. Okay, so let us begin. The three most common applications for roofing repairs when applying a roof coating are the following: airless spray machine, a roller and a brush/broom. Using an airless spray machine is an ideal tool for applying roof coating over a roof because it allows you to cover large sections of the roof with less labor and time. These machines pump and disperse the roof coating through a spray tip, spraying a consistent and even amount of coating onto the roof surface. It is recommended that the coating be applied in several cross-directional layers to confirm full coverage. You must keep in mind that wind can create issues with uniformity so be sure to either check the weather conditions before application or make sure you have a wind shield to avoid overspray. Rollers for roof coating are similar to rollers for painting. They come in short-nap, medium-nap and long-nap lengths depending on your needs. In some circumstances you will need a specialized roller to ensure full coverage over uneven surfaces and seams. Rollers offer consistency of coating thickness and placement. This application method for roofing repairs is more time consuming than using a spray machine, but may provide better consistency and outcome if you are not too familiar or comfortable with a fast spraying roof coating machine. Using a brush or soft-bristle broom for roofing repairs is ideal in small areas only. You do not want to coat the entire roof surface with just a brush or broom. This application method can be beneficial for small areas and those that require a little extra attention to detail for either aesthetics or waterproofing. National Coatings provides application guidelines for all of our roofing systems. Make sure you follow the guidelines recommended to ensure proper application and coverage of the roof coating system you choose. Often times, a spray machine and roller or even a combination of the three methods discussed above are great tools to have accessible while completing a roofing repair project. For more information, check out our Guide for Selecting Roof Coating Spray Equipment or contact us! Does Your Coating have Ponding Water Resistance? First, ASTM D6083, the governing specification for acrylic roof coating, has certain minimum LABORATORY requirements related to ponding water. The first is ASTM D1653,"Test Method for Water Vapor Transmission of Organic Coated Films". In this test, a piece of the roof coating is used as the bottom of a cup and the amount of water that passes through this assembly is measured. Lower values indicate that the coating is more water resistant. The second test is ASTM D471,"Test Method for Rubber Property Effects of Liquids". Simply restated, this test determines how "sponge-like" the coating is when submerged in water. Lower numbers indicate the coating will be less prone to swelling when submerged. Less swelling reduces stress at the bond between the coating and the roof substrate. The third test is ASTM C794,"Test Method for Adhesion-In-Peel of Elastomeric Joint Sealants". This test measures dry and wet peel adhesion. The wet peel adhesion test is conducted immediately after the coating and roofing substrate have been submerged in water for one week. To conclude: the "Real World" question should not be "Does your coating have ponded water resistance?" but rather "Does it stick when it is wet?" Call National Coatings 800-423-9557 or go to our Contact Us page if you have questions or concerns regarding ponded water. We are here to help you! 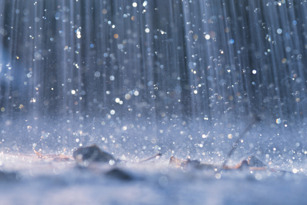 As we are approaching the winter season, rain is likely to occur. 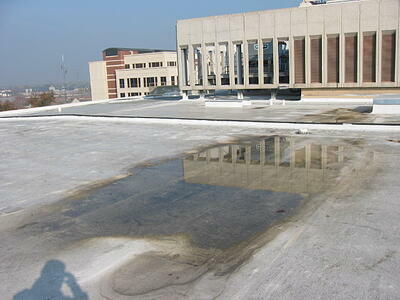 While this is beneficial to our environment, some building owners and facility managers cringe at the thought that they may need to do a few roof leak repair projects in order to protect the assets inside their building(s). Don’t let this be a worry-some issue; National Coatings is committed to helping you reach a fast and professional solution to solving your roofing issues. There is no better choice than to use National Coatings for your roof leak repair because our dedicated customer service team combined with our superior products is unbeatable. Whether it is dealing with our customers by phone, in person, or online, the same superior customer service skills apply and our goal remains the same – we want to keep our customers happy! We believe there is more to superior customer service than just being nice. It's all about effective communication skills, providing top quality services and products to meet our customers needs and wants, as well as, respecting our customers and being able to assist them with any questions and/or concerns they may have. We take the time and effort to get to know our customers and support them with their special products, delivery requirements and billing needs. If it's important to them - it is important to us! "I appreciate the effort that National Coatings put in to this project. National Coatings was very responsive to our needs in getting us the materials that we needed, when we needed them. Without the team effort from all players, this project could not have been completed on time." "I get calls from other coating folks - but I seriously doubt that I would get the high quality product & service I get from you. It's a pleasure to work with you!" "Keep up the outstanding business." "Not many areas you can improve on. Keep up the good work"
"Thanks for all your help. The coating business has been a nice part of what we do!" "The collaboration for the project with National Coatings was very helpful along the way. The change to the quick set product was accomplished on the fly and was a seamless effort due to the intimate association during the life cycle of the project. It would not have been successful otherwise as the timing was at the end of the season"
"National Coatings Corporation was helpful from start to finish. We choose them because their products reduce waste going to landfills, they are environmentally friendly with lower installation costs. The coatings are energy efficient and can be maintained indefinitely. We are very happy with the performance of our new National Coatings roof!"